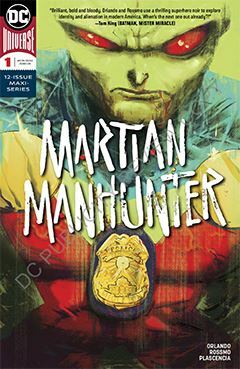 The Martian Manhunter is one of those characters that DC never seems to know what to do with. In the Silver Age he was a member of the Justice League, returning to action more recently since being featured in the animated TV series. The basic premise is he was a cop on his homeworld. Once trapped on Earth, he used his shape-shifting ability to masquerade as a cop, and his mental powers to to discern the innocent from the guilty. Yet somehow, over the years DC has felt obliged to maintain the concept of a Manhunter (with mulitpole iteration bearing the name), when J’onn J’onzz was waiting patiently to be EXACTLY that. He could have been akin to the Predator (but less bloodthirsty), hunting down criminals. So now DC is trying to give him his own ongoing series, to see if Steve Orlando can make it fly. I love the idea of an alien hiding himself so effectively among the police. It makes the story part police procedural, part science fiction, part super-hero. And that opens the door to countless possibilities. Let’s hope DC is willing to allow Orlando the freedom to capitalize on that.